Yesterday, I started my update of the educational blogs that I follow, noting that my initial post “Education Blogs” is still relevant. Those yesterday and today are listed alphabetically and not meant to denote priority order – I find all of them relevant, and there are a dozen others that I tried for awhile and then dropped as not being as meaningful to my life and professional craft. ReadWriteWeb………………………ReadWriteWeb is a blog of web technology news, reviews and analysis by Richard MacManus and his team, ranked in the top 20 blogs by Technorati. 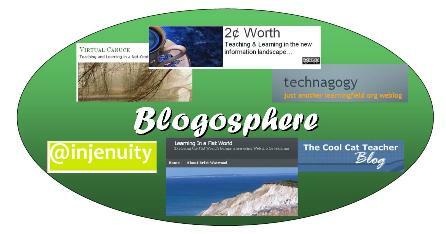 Good source of breaking technology and Web 2.0 news. Robin Good’s Latest News………….Robin Good out of Italy provide insightful and timely articles on all things regarding web media. Several months ago he had a short video podcast that he shot with his cellphone while riding his scooter through Rome. You have to love that! Steve Hargadon………………………Steve is the father of the Ning site – Classroom 2.0 – which counts over 7,500 members including me. I enjoy Steve’s insights into Web 2.0 and its application to education. Students 2.0………………………….A fascinating blog run by teenage students about students. Their insights into the flat world, their place in it, and their expectations for education are very revealing. Teaching Talia………………………Talia is an Australian technical educator who creatively incorporates Web 2.0 into her teaching, and then shares her lessons learned. Technagogy………………………….John Krutsch is another educator I met at eLearning 2008. John created the TweetCloud process that has gone viral worldwide. He has wonderful insights on using technology to enhance the human presence in teaching. Techne……………………………….Jeff Nugent, my colleague here at the Center for Teaching Excellence, shares his muses as he explores meaningful and innovative uses of technology to support learning. It is always interesting to see how conversations overlap between the coffee pot, Twitter and our blogs. The Edublogger……………………..This is Sue Waters’ other blog, in which she shares her tips on running an effective blog. Much of what I learned about the craft of blogging I learned here. The Power of Ed Technology……….Liz Davis out of Wellesley MA provides practical tips for using instructional technology. I particularly like her screencasts. The Thinking Stick………………….Jeff Utecht is the technology specialist at Shanghai American School and founder of the Learning 2.0 conference last year. His blog contains rich insights into our interconnected educational world. The Tom Peters Weblog…………….Tom Peters has been influencing me since his In Search of Excellence back in the Eighties. His latest book, Re-Imagine!, is a must read. While Tom’s focus is on excellence in business, his philosophies are directly applicable to education. Not for the faint of heart – Tom does not pull any punches! Virtual Canuck………………………Terry Anderson is another Canadian with extensive online experience. He is Professor and Canada Research Chair in Distance Education at Athabasca University – Canada’s Open University. That is the list … for today. I continue to keep one eye on the horizon for new value-added blogs, and I suspect that this list will continue to evolve. I have reached the point where I may need to drop one if I add one, but so far have not felt the need to do so. Thanks for following me. I’m so happy to know that my screencasts have been helpful to you. And now I have one more blog to follow, yours.